Charming cottage near the sea. Safe, secure, private and cozy. 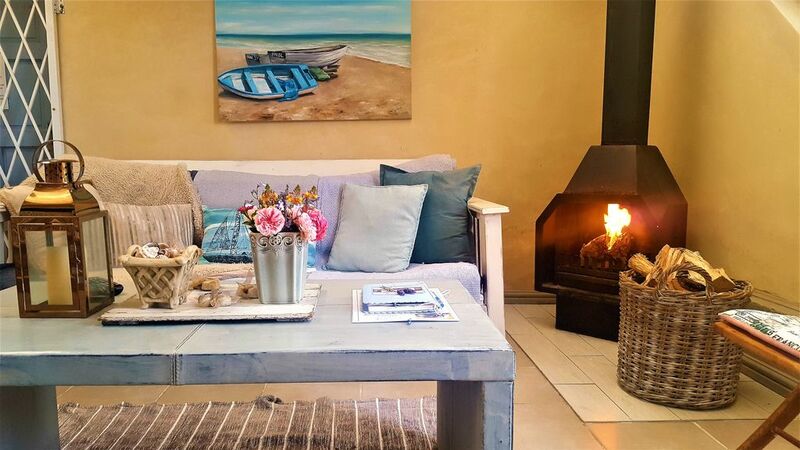 Charming and cosy Corner Cottage is just 1km from the beach. It is part of West Beach Cottages, where is sister cottage, Lilacs Cottage is 30m away. Both cottages can be rented out at the same time for larger groups. This a a quaint little cottage with a private bedroom with queen bed and an ensuite bathroom. The comfortable livingroom has a fireplace for cooler days and a TV which has Netflix, many streaming chnnels, Youtube and TV games. There is a DVD as well. There is a large double sofa bed and a single day bed which can sleep an extra 3 guests. There is a full country style kitchen with a dinning area. There is an oven and stove, microwave, crockery, cutlery, pots and pans, filter coffee machine, glassware etc. Private enclosed lush and tranquil garden with a hammock between two palm trees and tall blue-flowering plumbago headges. There is outside seating and barbeque. Fairy-lights come on at night around garden. The cottage decor is french country style and is full of character. The cottage is close to all amenities. Within short walking distance of the local beaches, restaurants, shopping centres and 50m from the My City bus stop which connects all over town. Safe and secure. A home away from home. Parking is outside the cottage with 24hr security camera surveillance. The cottage is supplied with crystal clear borehole water and so is not affected by any times of drought. Provided: All linen and towels, water, filter coffee, creamer, sugar, teas, rusks, body wash, hand soap, cleaning detergents and a basket of wood.